The Next Best Thing [Book Review] – my books. my life. When Ruth Saunders graduated from college, she packed up her life – and the grandmother who raised her – and moved to Los Angeles to be a writer. At 28, she finally gets her big break when the television pilot she wrote – a coming of age story about a young girl and her grandmother loosely based on her life – gets greenlit. But when her boyfriend dumps her and the she starts losing control of the show, her life seems anything but perfect. I’m so happy to be back in love with Jennifer Weiner. I adored her first four books, then fell behind, and then had a rough experience with Best Friends Forever. But I can say I’m a fan again. The Next Best Thing was everything I wanted from a novel of hers: a lovable, flawed main character, an uncommon romance, and a happy ending (pretty sure that’s not a spoiler). Ruthie was a great character. She’s been hurt – both physically and emotionally – and I couldn’t help but cheer for her. Even though I knew she would succeed in the end, I felt her frustration as I watched her struggle. The peripheral characters were also good. From her grandmother’s boyfriend, Maurice, who used to buy his suits in the boys department to her boss, Big Dave, who never takes anything seriously. And of course, her grandmother and her love interest. This book was also an interesting look at how a television series gets made, from the first draft of a pilot through its premiere. Any one who watches a little television should find that part fascinating. I can’t say much about Jennifer Weiner’s more recent books since I haven’t read them, but if you were a fan of her earlier books – like Good in Bed and In Her Shoes – I don’t think you’ll be disappointed with The Next Best Thing. I did love Jennifer Weiner’s earlier books. I enjoyed Best Friends Forever. I’ll definitely be looking out for The Next Best Thing. It was a great read for me too. I haven’t read her book from last summer, but I agree Good In Bed will always be my fav! 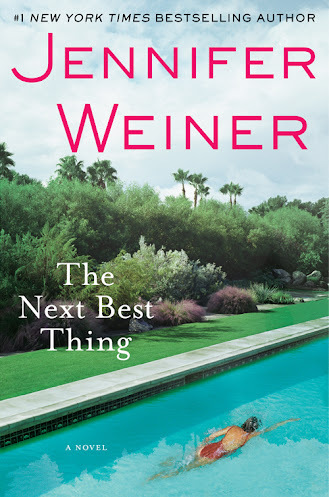 I haven’t read any books from Weiner in a very long time, and I am glad that you gave this one a thumbs up, because I need something light and fluff for the summer, but I don’t want to go in totally blind. Great review today. I really liked the way you expressed your opinion on this one!